For the past couple of weeks, we have been thinking together about what it might be to be a church which is known to welcome all with the love of God, a church that reaches out with grace and acceptance to draw folks in rather than push them away, a church that might be known as the Embracing Church. I have tried to suggest that the kingdom of God is created in such a way that we are constantly called to expand our thinking about who we embrace with the love of God. Last week, we looked together at some of the ways that we fall short of that goal, and asked us to consider repenting of the ways we exclude others from participation in the kingdom. Today we are going to take some time to move forward and think about what it means to call ourselves people of embrace. After all, “embrace” is not a word that is widely used today to talk about church folks. We talk about the church as a family or the church as the body of Christ, but to suggest that the church is about the work of embracing others is a relatively new way of thinking. What does it mean to be an embracing church? Isn’t that at the heart of what we do, or are we missing something that we need to think about in how we approach others in God’s kingdom? I want to do this by looking more closely at two words that we use in the church to talk about our relationship with others, especially others who are not or have not been a regular part of our community. They are words that arose out of the Civil Rights movement of the 1950’s and 1960’s, and have been an important part of our language in talking about relations across racial, ethnic, and gender boundaries. Yet, I want to argue that these words fail to catch the true spirit of what Christ is calling us to do in standing with and reaching out to persons both within our community and outside the church. While these words represent starting points on the way, they fall short of God’s full and rich intention for his people. Let’s start by considering the word “tolerance.” Tolerance is something that we have been working toward in society since the days of Martin Luther King Jr. It is especially talked about in schools, with a large program focused on teaching tolerance that helps people to reach across boundary lines and work toward relationships of civility and sometimes even respect. Any of us who were raised in the 1960’s or 1970’s probably sat through some sort of school assembly or class period focused on tolerance as a desirable virtue. When we look at the true definition of tolerance, we discover how small a step this is on the way to loving our neighbors as ourselves. Tolerance is defined as “sympathy or indulgence for beliefs or practices differing from or conflicting with one’s own” or “the act of allowing something.” Tolerance is the most basic level of allowing another into our space. It doesn’t require like, or love, or even respect. To tolerate another is to be willing to put up with them quietly and without complaint, but it requires no engagement with the other. Think again about the act of choosing sides for a team like we talked about last week. Those of us who were at the end of the line — those who were the last to be chosen — knew that we were tolerated, but not really considered worthwhile. We were tolerated for all sorts of reasons — from wanting to fill out a full team to the fact that Jonathon’s dad was the police chief and that would keep the cops from hassling us for playing in the field that said “No Trespassing.” We were put up with as a necessary evil, but not especially wanted. To be tolerated is to be told that you don’t really matter. Toleration (and the concept of inclusion which we will discuss later) has a problem. Like all relationships, it is a relationship with a power dynamic. But the power dynamic in tolerance is one in which the more powerful (the popular, the talented, or for that matter, those in the majority) hold all the cards. The powerful have the power to choose who to tolerate or not. Those who for whatever reason find themselves lower in status are dependent on the powerful to determine if they are in or out. Toleration is a relationship built on a power dynamic by which one person or group has the power to put up with the other . . . or not. For some reason many seem to think toleration is a great feat. And in some ways it is. You see, “putting up” with someone takes a great deal of emotional energy. This is a person or group that you frankly don’t want to be with, but in the interest of propriety you tolerate them all the while burying down inside your own feelings of anger and the desire to be anywhere else then where you are now. It happens to all of us – it’s a part of the human condition, I suppose. Yet, Jesus called for much more than tolerance. His own example of eating with sinners and tax collectors suggests that he sought deeper relationships than simply putting up with others whose ethics and faith system was different from his own. “Love your enemies,” Jesus told us, not put up with them reluctantly. This takes us to the second word that is more common today, the concept of “inclusion.” The notion of being an “inclusive church” is important to United Methodists today. Look through our Book of Discpline and you will find all sorts of language calling us to inclusivity. The call to be inclusive is one that recognizes that we need to avoid excluding others from the party, and is one step forward from the concept of tolerance, and is an important word in the life of the church. Unfortunately, inclusion suffers from the same problems as tolerance, for it continues to describe an approach to others that places power in the hands of the one who is deciding who is included . . . and who isn’t. While inclusion implies a deeper relationship than simply tolerating another, that relationship is still in the hands of those in control. You see, those who have power ultimately are the arbitrars of who to include or not. Those whose power is diminished in the relationship may indeed be included, but only through the good graces of the one calling the shots. I began to realize this a few years ago after watching a group of kids on a Sunday afternoon. The older child had brought home a friend to play with, and they secluded themselves in the older kid’s bedroom to giggle and tell jokes and do whatever it is that kids do when they get together. However, her younger sister, like all younger siblings, wanted to be in on the action. She wanted to be a part of what they were doing, and she stood outside the bedroom yelling and crying to be included. “Do we have to?” they yelled back. The girls opened the door, and the younger sister gained admission to the inner sanctum. They included her in their games, but reluctantly, and only because someone with more power told them to. But they didn’t embrace her. For many of us, that is the problem with inclusion. We have been ordered by higher authorities to include others, sent to inclusivity training to be sensitive to the differences of others, and we open the doors thinking that is enough. But Jesus has a higher standard. He isn’t content to merely sit back, with arms crossed, deciding whether to let them in or not. His disciples weren’t called to hang out in the synagogue, waiting to “put up” with others or letting them in because Christ told them to. No, instead they were sent out, to actively welcome others with the amazing and all encompassing love of Christ. To be a part of God’s kingdom according to Jesus was to welcome the powerless – the poor, the children, the sick, the sinners – and to wrap our arms around them. The call to life in the kingdom is to be like the father of the prodigal son, running as fast as we can to those in need, wrapping them up with a huge embrace, and calling to one another that it’s time to part for the lost has been found. And isn’t that what we all want and need . . . to be embraced by the one who created us, loved deeply by the savior of the world who came to demonstrate what love is all about? Aren’t we all looking for signs of acceptance in the kingdom, a recognition that we are not worthless, that we are (as Jesus said) pearls of great price? “What are the greatest commandments,” the Jewish rabbi asked Jesus. To be people of embrace is to love others in the same way that we want to be loved. Yes, in an intolerant world, we want to be tolerated. Yes, in a world that would exclude others, we want to be included at the table. But most of all, at the core of our being, we want to be embraced. We want to feel the loving arms of God surround us and know that we are deeply loved. We, as the body of Christ, are the arms of God. If anyone is going to know and experience the embrace of God, it’s only through our ability to be people of embrace. Our calling, our task in the world, is not to simply sit back with open hearts, open minds, and open doors. It is instead to reach out, stepping forward, opening our arms, and moving toward those who need to know the amazing love of God. 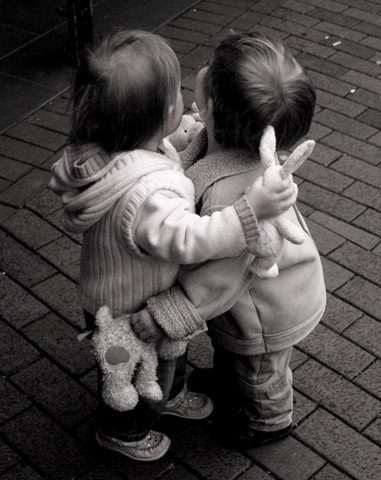 “I need a hug,” we tell one another when we’re feeling down. Well so do the people of Antioch, the people of Nashville, the people of Tennessee, and the people of the entire world. It’s our job to give it. Tolerance is like a cancer… At a time when the world has lost its way, sin is rampant, there is no distinction between those who serve God and those who don’t. The church is synchronizing with the world instead of coming out from among them… Jesus ate and drank with sinners alright…But it was to lead them out of sin, not to endorse it.